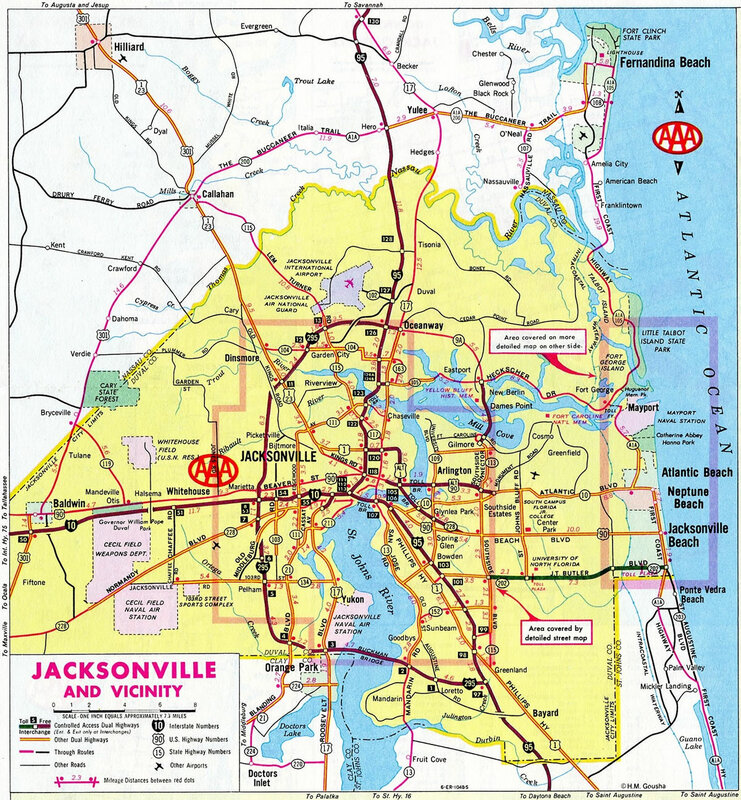 Florida 202 travels 13.04 miles, mostly as a limited access highway, from South Point in Jacksonville to Jacksonville Beach. The state road is better known by its formal name, J. Turner Butler Boulevard (JTB). It doubles as both a commuter route for the growing Southside of Jacksonville, but also a conduit for beach traffic headed to Jacksonville and Ponte Vedra Beaches. Interchanges along the freeway are unnumbered. The westernmost segment of Florida 202 travels at grade between U.S. 1 (Philips Highway) and Interstate 95. 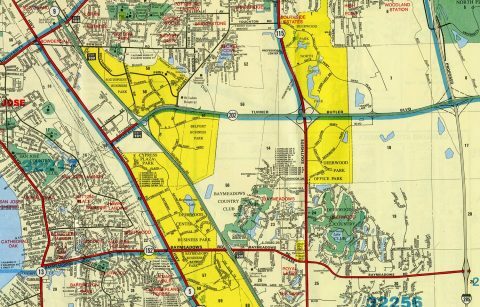 This 1998 map shows a proposed folded diamond interchange with Philips Highway and a short extension west to Kings Road. 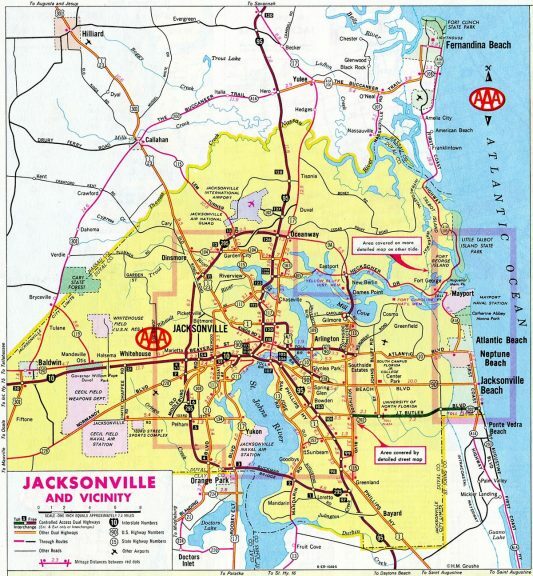 Toll plazas were located on Butler Boulevard east of St. Johns Bluff Road and west of Florida A1A until 1989. The limited access portion was disconnected to Interstate 95 at that time. Trailblazers for Florida 202 and Interstate 95 previously posted on Salisbury Road north at A.C. Skinner Parkway. These were removed by 2015. Photo taken 03/14/10. 1988 installed trailblazers for I-95 and SR 202 formerly in place along Salisbury Road south at A.C. Skinner Parkway east. The I-95 shield was removed by 2011, with the SR 202 gone by 2013. Photo taken 03/14/10. Belfort Road connects a number of office buildings, hotels and industrial businesses with Florida 202 (Turner Boulevard) to adjacent Interstate 95. A set of trailblazers directs motorists on Belfort Road north from A.C. Skinner Parkway in this scene. Photo taken 03/14/10. A narrow-width shield for Florida 202 directed motorists onto Butler Boulevard east from Belfort Road north. This assembly was replaced by 2013. Photo taken 03/14/10. Kernan Boulevard dead ends to the immediate south of east side ramps with Florida 202 (JTB). Photo taken 03/14/10. An overhead directs traffic from the stub end of Kernan Boulevard north to Florida 202 (JTB) west toward Windy Hill and Baymeadows. Photo taken 03/14/10. "Tolls coming to suburbs." Florida Times-Union (Jacksonville, FL), September 26, 2006. "Project survives costly delays." Florida Times-Union (Jacksonville, FL), May 25, 1996. "Rush-hour relief." Florida Times-Union (Jacksonville, FL), March 13, 1997. "Smoother sailing today from Butler to 9A south First of 4 ramps completed in $84 million interchange project." Florida Times-Union (Jacksonville, FL), July 28, 2008. "I-95 at J. Turner Butler Boulevard interchange improvements." Northeast Florida Roads (FDOT web site). "I-95/JTB interchange project nearly complete." WJXT (Jacksonville, FL), August 30, 2017. "Opening Of JTB-I-95 Flyover Ramp Delayed; Was Set For Wednesday." >em>WJCT (Jacksonville, FL), September 5, 2017.